Nvidia will upgrade its Shield handheld gaming console to Android 4.4.2, code-named KitKat, with updates being pushed out over the air starting April 2. In addition to the latest Android features, the OS update will also bring a better console and remote gaming experience, said Andrew Coonrad, technical marketing manager for gaming technologies at Nvidia. The Shield console has a 5-inch screen on a protective hatch that pops out of a gaming controller. The device runs on Nvidia's Tegra 4 processor, and has the buttons found on PlayStation 4 and Xbox One controllers. Shield can also be a mini-tablet and the screen can display images at 720p resolution. Other features include 802.11n Wi-Fi, a Mini-HDMI port and Bluetooth 3.0. Games for Shield can be downloaded from Google Play store or Nvidia's TegraZone app, which will have more than 330 games with the OS update. The remote game-streaming features aim to make PC games easily accessible to the Android-based consoles. The console's enhanced GameStream feature will allow users to stream PC games to Shield consoles located remotely. Users will be able to play streaming PC games from thousands of miles away by connecting Shield over the Internet to a gaming PC with a compatible GeForce graphics processor. The GameStream feature will discover a host gaming system within a home or wide-area network, Coonrad said. Wireless streaming of PC games to a Shield is currently only possible over home networks. Shield's game-streaming features are only compatible on specific graphics cards. Nvidia in February announced the latest GeForce GTX 800M-series graphics processors for thin-and-light laptops, which support wireless game streaming. The streaming features are also being introduced to the latest desktop GPUs from Nvidia. Remote and cloud gaming features are already available on the Xbox One and PlayStation 4 consoles. However, Nvidia is providing a different take to cloud gaming by drawing Shield closer to the fast-growing PC gaming market. Beyond games, the Shield can now also function as a remote desktop and run applications such as Microsoft Word delivered by host PCs. But the Shield does not have a keyboard, making the utility of this feature limited. Users will also have better control over the quality of PC gameplay on Shield. Users will be able to set the frames per second and bit rate per second at which games are delivered from PCs to Shield. Games were being played at the wrong resolutions, and this feature will improve the quality of gameplay, Coonrad said. The level of customization can be zeroed down to each game and such settings are useful when Shield is connected to an HDTV and used as a console. 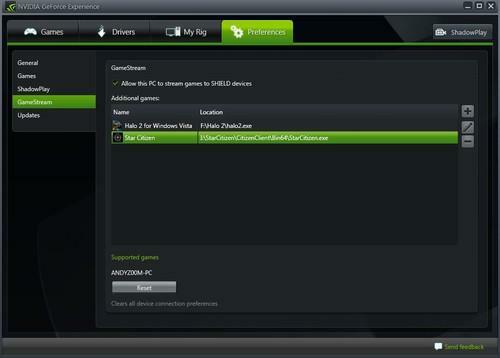 Games and applications to be streamed can be selected in the GeForce Experience software on compatible PCs. Shield works with the PC software to apply the individualized streaming settings to each game. Nvidia also said it was cutting the price of Shield to US$199 as part of a promotion through the end of April.